BUCKER BESTMANN BU-181 MK6 The Bü-181 Bestmann prototype first flew in 1939 with a Hirth engine and was an instant success, being ordered in large numbers by the Luftwaffe as a trainer. In the 1950s, the Heliopolis Aircraft Works in Egypt acquired a licence for the type and built around 300 Gomhourias, with a 145hp Continental engine, for the Egyptian and other Arab Air Forces. In all, 3,400 aircraft were built, only a handful of which survive today, of which this is one. 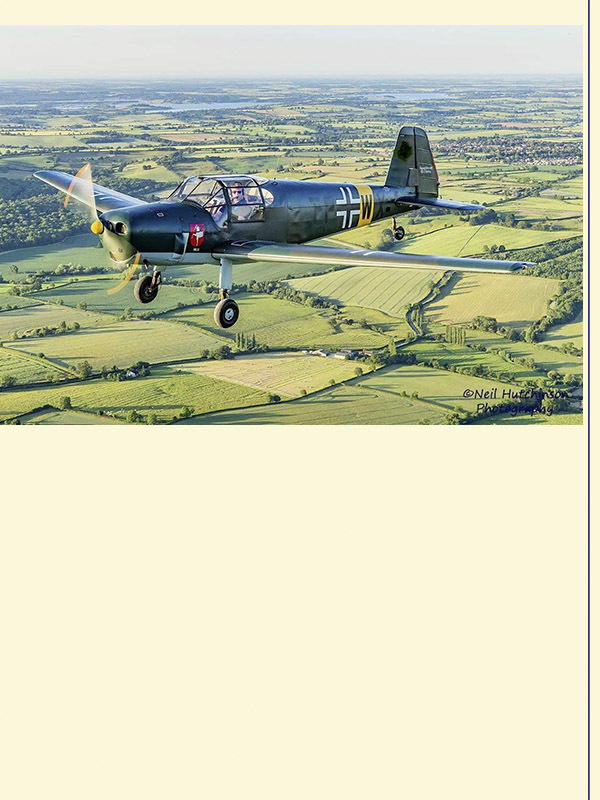 This aircraft was imported into the UK in 2011 from Oldenburg in Germany and after a restoration has displayed at many UK and European airshows. This type of aircraft is most famous for its role in the film The Great Escape. The Aircraft is generously provided by Michael Wright of Cirrus Aircraft UK Ltd.